Top scorer James Collins is determined to reach the milestone of 20 league goals for the Hatters this season. 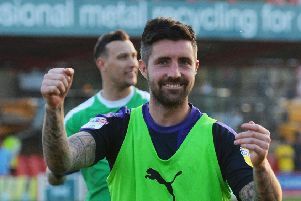 The 28-year-old finished one short of the magical number last term as Luton won promotion to League One. He has only managed the feat once in his career previously, that when at Crawley Town in the 2016-17 campaign, when he notched 20 league goals, his highest tally to date. Saturday’s double at Shrewsbury took him to 18 for the season, all in League One, as on trying to make 20, Collins said: “Yes, 100 per cent, I was a bit gutted I didn’t get 20 last year. “I got 19 in the league last year, and on a personal note I was gutted about that, but promotion was the main thing, so I didn’t want to let it bother me too much. “Twenty’s always the aim as a striker, so if I can get there then I’d be absolutely delighted. After taking nine games to open his account for the campaign and only having four to his name by mid-November, Collins is now in a hot run of form, scoring seven in his last four matches. He continued: “This season has gone really well for me personally. “I had a difficult start, but I always knew if I kept doing the right things and keep working hard then things would always come good and thankfully for me, they’ve come good at the minute and come good for the team. "So I’m going to try my hardest not to stop doing those things and keep going." Town interim boss Mick Harford, himself a striker of some repute during his playing days, scoring 92 goals in 217 appearances for the Hatters, admitted he has passed on the odd pointer to Collins since taking change. He added: "We were similar play, he's a good target man, we speak about it, tell him positions to get into but naturally, he’s always in the right area at the right times, in and around the penalty area, and he’s a really, really good finisher. "Can I help him? Yes I can give him little bits of advice here and there and hopefully he takes it on board. "But sometimes in the heat of the battle, you’re not thinking like that, it's just instinct. "At the moment his instincts are very good and he’s getting in the right positions."